These blog posts contain reviews of IELTS books and links to other useful resources for your IELTS preparation. Is the book IELTS Trainer suitable for you? IELTS Trainer contains six complete IELTS Academic practice tests with guidance and tips on how to answer the questions in the first two practice tests. What I like most about this book is that it focuses on exam strategies by giving suggested steps to take when answering different types of IELTS question. The book includes all of the main types of question in the IELTS Listening, Reading, Writing and Speaking tests. Another feature I like is that (unlike other IELTS practice tests) this book includes advice/tips on answering specific questions and explanations about why particular IELTS Listening and Reading answers are correct or incorrect. The book highlights some useful language for the Writing and Speaking test, e.g. phrases like ‘For the most part…‘ and ‘In general…‘ for making general statements. The book also highlights some common mistakes that IELTS candidates make. One mistake highlighted is missing out the preposition ‘with‘ after the verbs ‘agree‘ and ‘disagree‘, e.g. “I strongly agree the idea that…” instead of “I strongly agree with the idea that…“. Are you one of the 2.2 million IELTS candidates who’ve taken the test in the last year? The latest IELTS statistics show that over 2.2 million IELTS tests are taken every year – a dramatic increase from the 43 000 IELTS tests taken twenty years ago in 1995. If we take the average cost of the test as US$200, IELTS candidates spend around US$440 million on taking the test each year! (IELTS test fees vary from country to country – you can find out how much an IELTS test costs in your country here). 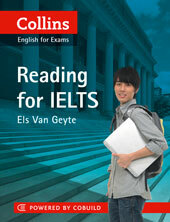 Is the book Reading for IELTS suitable for you? If you find the IELTS Academic Reading test difficult and need to improve your reading band score to a 6.0 or above, then read my review of the book Reading for IELTS below. I think the best feature of this book is that it includes a unit on each of the 11 types of IELTS Reading question, including questions that ask if statements are TRUE, FALSE or NOT GIVEN. 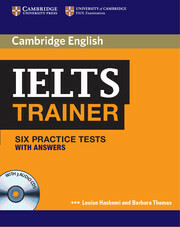 The book includes exercises and suggestions to help you understand how to answer each type of IELTS Reading question. Another feature I like is that (unlike most IELTS books) this book includes explanations at the back about why particular answers are correct or incorrect. 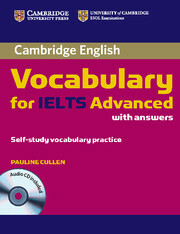 The book also contains a complete IELTS Reading practice test at the end. Is the book Vocabulary for IELTS Advanced suitable for you? To get a better idea of whether this book will help you with your IELTS preparation, read my review of the book below. What I most like about this book is that it includes vocabulary on a variety of common IELTS topics, including study and work, travel and tourism, technology, crime and punishment, and government. To keep you interested and to show you how the vocabulary can be used in the IELTS test, each of the 25 units includes a variety of vocabulary exercises and IELTS tasks. The book includes some useful IELTS test tips. My favourite tip: If you need to get a band 6.5 or above for your writing, check your writing for the most common spelling mistakes made by IELTS band score 6.0 candidates (i.e. ‘their‘, ‘government‘, ‘environment‘, ‘which‘, ‘until‘, ‘believe‘ and ‘nowadays‘). The book highlights some vocabulary mistakes that many IELTS candidates make. One of these mistakes is that a lot of candidates say ‘in the internet‘ instead of ‘on the internet‘. The practice test questions that I tried are generally at a similar level of difficulty to the ones in real IELTS tests. The book contains lots of ideas about how you can remember new vocabulary.